South African composers Paul Hepker and Mark Kilian have provided the score that helped drive 'Tsotsi' to its Academy Award win as Best Foreign Language Film. A Miramax film from director Gavin Hood, 'Tsotsi' stars Presley Chweneyagae in the title role as a gang leader who grew up on the streets of Johannesburg's shantytowns. The film is a psychological drama in which the protagonist is compelled to confront his own brutal nature and face the consequences of his actions. The atmosphere of the score was designed to reflect not just the landscape of Tsotsi's township, but also the external and internal struggles he goes through to find his redemption. To do this, Hepker and Kilian worked with accomplished singer, guitarist, percussionist, composer, arranger and band leader Vusi Mahlasela, whose songs address social and political issues. He has traveled the world with his messages of peace, but still lives in Mamelodi township, where he grew up. Both native Africans, 'Tsotsi' marks Hepker and Kilian's first collaboration, and each has enjoyed successful careers in music. Paul Hepker was South Africa's top musical director, known for several award-winning stage productions and the South African Grammys and Tonys, as well as performing on stage and composing for TV and radio. Mark Kilian's repertoire of US work has been featured in several films, television programs and video games, including "Raise Your Voice," "Jake In Progress," "F/X (The Series)" and "The Animatrix." Chatting recently with both the films' composers, Mark Kilian and Paul Hepker, I first asked that with 'Tsoti' having received the Oscar for Best Foreign Language Film, how does such an award affect any and all their future recordings and collaborations? Did it place them up on a higher level of interest, perhaps? PAUL - "Yes, 'Tsotsi' has brought us a lot of exposure since starting to win festivals around the world last year. It brought me representation with ICM, which in itself means that my name is being suggested for movies that I probably wouldn’t have had a shot at. Talent in Hollywood is ‘product’, with a perceived value. Winning an Oscar gives that product (me!) a rubber stamp, a watermark, that for a short while at least is probably attractive to would-be investors, both financial and creative. Regarding future collaborations: there will definitely be projects that Mark and I will be pitched for as the ‘team’ that composed for 'Tsotsi.' The ramifications of 'Tsotsi’s' huge success were so far from our minds when we first got involved in the movie two years ago – we are happy to follow whatever fortune comes our way. It’s all good. Lennon and McCartney did most of their best work together!" MARK – "This is definitely a ‘strike while the iron is hot’ kinda thang. a very special opportunity has been presented here and it is up to us to make it real!" How did your involvement with Vusi Mahlasela come about and what did you take away from your working relationship with him? PAUL - "Vusi is an inspiration to musicians, singers and songwriters back home. His credentials as a true South African, a protest poet, are impeccable. He really is on par with Mandela in that sense: a beautiful and powerful man with an irrepressible spirit and unquestionable integrity. I had seen him perform numerous times when I was living back in South Africa – he was performing at my brother’s bachelor party in Melville when I first got to meet him. We got to a point in the writing of the score where Mark and I identified the need to find a “voice” (figuratively) for the character of Tsotsi as he discovers his essence. Shortly thereafter Mark was at a restaurant having dinner when the waiter mentioned that Vusi was in town, performing at the Market Theatre. Mark abandoned his dinner, went to the concert and was convinced that the voice we were seeking was “The Voice” (Vusi’s nickname). Anyway – it turned out that I went to school with his manager from BMG, Lance McCormack – so we could at least get ‘in the door’ to pitch the idea that we get Vusi to sing on the soundtrack. It was something he hadn’t done before, so there was a lot of convincing to be done. But the rest, as the say, is history. Vusi himself is one of the humblest, most spiritual people I have ever met. He is so ‘in tune’ with the energy around him. He has such a grace, is so centred, that he can reach for the rarest extremities of truth in a moment. He literally soars to places I can only dream of going. I think our collaboration was rewarding for Vusi, too. Not having to accompany himself freed him to ‘channel’, through his voice, that deeper voice that lives so strongly in him." MARK - "Paul and I have always been huge Vusi fans. We had dreamed about asking him, but he’s too big a star for our little movie!!! But one night after a hard day in the studio working on the music, i was having dinner at a great restaurant in Johannesburg when the waiter told me he was performing across town. So i dropped my food and flew just in time to make the concert. This was my first time seeing Vusi live and it really fit right into the emotional headspace I was in at the time, trying to make Tsotsi’s story come to life musically. So after much emotion after the concert, i spoke to paul the next morning, and we found out that Vusi’s manager at BMG Records used to go to school with Paul. And the rest is ....!" Having created a score that more reflected the external and internal struggles of the main character, how easy was it compared to having stuck to just artful 'landscape' music, etc.? PAUL - "In a sense, Mark and I started out creating an ‘ambient’ score: something that would be present, like the corrugated iron walls, or the smog hanging above the townships. There was so much going on onscreen, but most of it was extremely subtle – a glance, a shrug, the raising of an eyebrow – so we initially wrote music that was part score/part sound design. (A few of these cues remain in the film: stalking Gumboot, Morris, Miriam...) This minimalist approach helped raise the tension without being too melodramatic, too obvious. Then the editing period was extended and our initial intention to use a South African string orchestra to ‘sweeten’ the score was no longer possible (Christmas holidays). At the same time it became clear to us that we needed to find the ‘yin’ to balance the ‘yang’ of the Kwaito music, and there is such a strong choral/vocal tradition in South Africa that using that palette was the most powerful way to express the spirituality that transforms the film from being a hopeless gangster movie to one of redemption. As we added solo voices, and eventually choirs, we found that we were amplifying that story arc. Using Khanyo’s voice in the scenes with Miriam, and Vusi’s voice in the flashbacks, and then supporting them with choirs as Tsotsi’s journey unfolds, we found that we could add a layer to the characters and their journeys, by giving their internal voices an outlet." MARK - "The main character in the film is really Tsotsi’s journey from the beginning of the film to the end; the arc of his character’s self realization. He undergoes a huge transformation and the audience had to be able to buy this wholesale, or the film would have fallen flat. Thank God for Presley!!! Musically, we had to allow the audience to feel this journey and experience it emotionally. 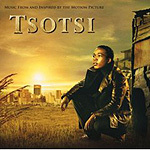 so there is a fairly wide chasm between the seemingly disparate elements in the score: the Kwaito music, the ambient ‘music design’ atmospheric part of the score at the beginning of the movie, and the emotionally charged and vocally based music that becomes more prevalent as Tsotsi’s self realization unfolds toward the end of the film. The Kwaito speaks of where Tsotsi comes from, the atmospheric stuff speaks to his immediate life and surroundings, and the melodically stirring vocal stuff is calling Tsotsi all the way from the end of the film!" Paul, please tell us more about your days touring with Johnny Clegg & Juluka and your upcoming solo album "Touring with Johnny was a great experience. I replaced 2 keyboard players, one of whom played saxophone and flute (Keith Hutchinson) - so the actual performance side of it was quite hectic: trying to cover all the keyboard, sax and flute parts while singing backing vocals in Zulu was challenging, to say the least! Unfortunately at that stage in my career, I was doing way too many things – wearing too many hats – and fitting the touring in with my other commitments meant I never really had a chance to sit back and enjoy the ride. Performing at all those festivals, traveling and seeing that other world as part of a band as respected and loved as Johnny’s was something I will always cherish. More than that – to get to know Johnny on a personal level was a real privilege. He has such a vision, such a grasp of the things that make our South African culture so rich – I learned more while conversing with him on planes and buses than I did in two years of philosophy and anthropology at University! He is a remarkable man. My solo album... Hmmm. I have so many unfinished projects. The ‘solo album’ thing is almost a running joke! I am drawn to the singer/songwriter genre (Joni Mitchell, Nick Drake, Tom Waits) but have yet to really find my own voice. I have accompanied and written for such wonderful singers, that I always feel the songs be given a better treatment by those who consider themselves singers. On the other hand – I feel I am entering a new phase. The Universe rewards action. I just have to do it and let it go!" Mark, please tell us more about your involvement with Nu Jazz Connection and Shades and your upcoming album with 'The Ape Quartet.' "Shades and Nu Jazz Connection (with Darius Brubeck) are bands I was with back inDdurban over 15 years ago. However, Ape Quartet is now!!! We’re finishing off our 2nd album. Fellow composer and close friend Christophe Beck is my partner in the band. It is all about Electronica in a more experimental and musical framework, while remaining very minimalist. It’s great fun and I love working with him. I’m also currently writing, arranging and recording strings on a new record for Glenn Hughes (of Deep Purple fame) and Chad Smith (Red Hot Chili Peppers). God bless rock and roll!!!" What's next in the soundtrack world for you both? PAUL - "I have no idea – except that I am raring to go! I think I am drawn more to socially conscious ‘independent’ films. Because of my classical and world music background I feel more comfortable scoring films that allow my natural compositional style to flow freely. Not to say I couldn’t score ‘blood and thunder’ blockbuster films, but I would love to have the opportunity to develop my own voice, to become known for certain types of score." 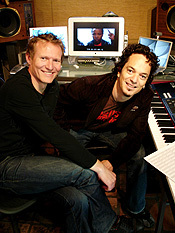 MARK – "I’m just finishing off the last episodes of TV shows ‘Kitchen Confidential’ (Fox) and ‘Jake in Progress’ (ABC) with fellow composer Daniel Licht. and now that we have snaps with young Oscar in hand, we’re getting some interest and i would love to find some films which we can be as passionate about as we were about Tsotsi. Not to mention directors who are as awesome to work with as Gavin was." What '80s (and possibly cheesy!) pop song would you love to re-compose today if asked ... and why?! PAUL - "Re-compose? Wish I’d written? Wow! I was a teenager in the 80’s. I listen to that music all the time: Howard Jones, Nik Kershaw, Depeche Mode, Duran Duran... I was in a band at Michaelhouse (high school) called New Era. We did a couple of concerts at sister schools and had a fleeting taste of what pop stardom might have felt like. Doing originals and covers – Face to Face, The Helicopters, Dog Detachment! I guess if I had to pick a song – maybe “Hide And Seek” by Howard Jones, or “The Hurting” by Tears For Fears. Contrary to popular belief, the 80’s bands had songs with deep spiritual aspects. The sounds were very cheesy, though! Simmons drums. DoooDoooDooo. Remember them? It was a very inventive period. The machines took over and they haven’t stopped since!" MARK - "'Da Da Da' by Trio. I’ve always wanted to re-arrange that song for Bulgarian Men's Choir!" Lastly, I like Penguins ... do you?! PAUL - "I prefer Pelican Bonbons, or Seagull-sicle. (And no, they don’t come with wafers you silly bunt!)" MARK - "They’re not too bad for mammals, but I think the emperor penguin band is much closer to my understanding of what a good, socially responsible mammal should be. Seriously, emperor penguin is a strange but interesting band worth a listen!" If you would like to win an AUTOGRAPHED 'TSOTSI' CD from both Mark Kilian and Paul Hepker themselves, just answer this easy question: 'Tsotsi' is adapted from a novel by whowhich author?